MoviePass arrived at the Sundance Film Festival this week not just as seller of cheap movie tickets but as a buyer of the movies themselves. 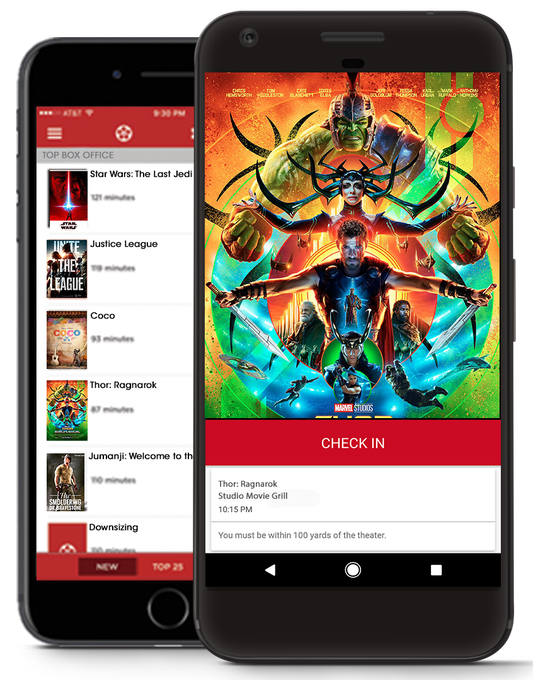 The New York-based movie theater subscription service has launched MoviePass Ventures, a wholly owned subsidiary that will co-acquire films with distributors. Although details are scarce, and no distributor partnerships or film acquisitions have been announced, the move provides more insight into how the company plans to make money. MoviePass relaunched in August with an all-you-can-watch movie subscription plan for just $10 per month. Subscribers can go to one movie per day, every day, with no blackout dates (excluding Imax and 3-D showings) for one flat monthly rate that’s about a buck more than the cost of one average movie ticket — and a lot less for many moviegoers. Earlier this month, the company announced it had surpassed 1.5 million subscribers. Meanwhile, MoviePass, which is majority owned by Helios and Matheson Analytics Inc. (NASDAQ: HMNY), reimburses movie theaters for the full price of those tickets and is operating at a loss as it attempts to convince the industry that its service increases moviegoing. And such increases in the theatrical window pay dividends downstream on platforms such as DVD/Blu-ray, digital, streaming, pay TV, network television, airlines and hotels, and foreign sales. MoviePass will apply these marketing strategies to the films it co-acquires. “Given the successes we have demonstrated for our distributor partners in ensuring strong box office in the theatrical window, it’s only natural for us to double down and want to play alongside them — and share in the upside,” said CEO Mitch Lowe in a statement. “We aren’t here at Sundance to compete with distributors, but rather to put skin in the game alongside them and to bring great films to the big screen across the country for our subscribers,” added Helios and Matheson Analytics CEO Ted Farnsworth. MoviePass is a service that lets subscribers go to the movies as many times as they want for $9.95 a month. The seven-year-old company touts itself as the solution to high ticket prices for consumers and stagnant ticket sales for theater chains. But MoviePass has had a rocky road to its current 1.5 million subscribers. The company took a while to find a price that worked for consumers. When it rolled out the $9.95 service this past August, the company was unprepared for the surge in demand. Meanwhile theater chains remain wary of any incursion on their turf and most still make MoviePass pay full retail price for tickets it distributes to subscribers—meaning it loses money on almost every transaction. In an expensive place like New York City the cost of a movie ticket can be $16. MoviePass is making a bet that by losing money to acquire customers now it will drive so much more traffic to theaters that eventually the chains will have to cut the subscription service in on the increased action--presuming, of course, that MoviePass doesn’t run out of money first. MoviePass CEO Mitch Lowe led the company to 1.5 million subscribers. The company was cofounded by Stacy Spikes and Hamet Watt. Since June 2016, however, it has been led by CEO Mitch Lowe, 65, former founding executive at Netflix and COO and President of Redbox. In 2017 Lowe engineered the sale of a majority stake to analytics firm Helios and Matheson Analytics for $27 million. In this interview which has been edited and condensed, Lowe talks about how he plans to make the company profitable and why marketing a subscription movie service is a little like selling health insurance. Natalie Robehmed: How did you get involved with MoviePass? Mitch Lowe: I left Redbox in November of 2011. In 2012 a friend introduced me and Mark Randolph, one of the cofounders at Netflix, to the founders of MoviePass. We saw that they were going after this niche audience of heavy moviegoers and they were pricing it as such: $30, $40, $50 a month. We started advising them to look at the people who aren't going as much. They didn't see eye to eye with us, so Mark and I walked away at the beginning of 2013. In January 2016 I was at the Sundance Film Festival at a party at Chris Kelly's house. Chris, who had been Facebook’s first chief privacy officer, had become the major shareholder in MoviePass. Over the next couple of months we kept talking and then finally I invested in June of that year and came in as CEO. Robehmed: How much had the company raised at the time? Lowe: Just under $14 million over four or five years. Robehmed: How many subscribers were there? Lowe: There were about 23,000. The average price was $35. They had different price points by market: New York was $44.95, Kansas City was $29.95 and then there was a mid market at $34.95. I think 70% of the subscribers were in those higher cost markets. Robehmed: What did you do when you took over? Lowe: I wanted to understand a couple of things. One was, were those people who only go to four or five movies a year interested in going more? We found out there are 200 million people that tend to go four to five times a year. Then we researched "What's the correlation between what you charge the customer and how often they go?" At $45, our average customer went to 3.8 movies. At $35 they went to 2.8. At $25 they went to 1.8. And at $14.95 they went to 1.1. There's some seasonality in that, it goes up a little bit in December and down a little bit in February. For our target audience, which is people under 35, one of the biggest impediments is "I don't know if this movie's worth it." Having a subscription where, if you see a movie and don't like it, you can just walk out, that's really worth money. At $14.95 it was still a big deal, but at $9.95 there wasn't a single person who we interviewed who didn't say, "I'd be crazy not to try this." Every price above that, we lost people. Robehmed: But at $9.95, you’re losing money even if they only go to one movie a month. Was it hard to find investors willing to bankroll that? Lowe: I couldn't get anybody to believe. When you do a subscription, especially an all-you-can-eat, the first subscribers you get, about 11% of the total, are going to be in high cost markets and they're going be people who see a lot of movies. It's like health insurance: The first sign ups are the people that are going go to the hospital. You have to weather the storm to get to the profitable subscribers. You've got to get enough breakeven customers to off-set the expensive ones. I think I met 150 different VCs and family funds. Then I ran into Ted Farnsworth who owns this company called Helios and Matheson in May or June 2017. He was the first person to really believe in the $9.95 price point and was willing to come to the table with the money that it would require. Funding a company like this is not a small task. We are going to need $100 million to get up to profitability. Robehmed: Why did you wait until Helios and Matheson came along to move on the $9.95 price? Lowe: We didn't have the funds to support it. I wanted to go into this more conservative, so I was ready to do $14.95 to $19.95. And he said, "No. You’ve got to do what the data tells you." I knew then that I had someone who was a big believer and a supporter, and had the ability to help me get the funding for it. We signed the deal on August 15 and that morning launched the service. Robehmed: How did that go? Lowe: The first two days we signed up 150,000 subscribers. We were totally unprepared. If you look at the stock purchase agreement between us and Helios and Matheson you'll see there is a bonus clause that if we hit 150,000 in 18 months or 15 months, we'd get $2 million. And we hit it in two days. We were only prepared for about 100,000 subscribers in a month. Our credit cards that we send people have an eight-week turnaround time and we only had one authorized shipper who could ship 50,000 a week. So it took us eight weeks to be able to get a whole new supply. Robehmed: How many people got mad and canceled? Lowe: I think 4.2% of people canceled in the first month and that dropped down to 2.2% or so in the second month, and then 1% or something in the third. Our growth has just continued. We're bringing in thousands and thousands every day. And our customers are going to twice as many movies as they went to before. Sixty to seventy percent of our subscribers say, "I wouldn't have gone to the movies if it hadn't been for MoviePass." They tend to like the movie at a higher rate. Sixty to seventy percent say they recommend it. On big titles like Justice League, we bought 1.8% of the national box office, but titles like Lady Bird, we're 10% of the national box office. Robehmed: Are MoviePass subscribers more interested in independent films? Lowe: They still see their Star Wars and their big films. But they use MoviePass to go to the smaller films that they previously said, "I'll wait 'til it comes out on Netflix." My real mission here is to create a better way to distribute small films that can't find an audience. When we build this to 10 million subscribers, it will be the perfect way to build opening weekend box office. Our customers have no incremental cost of going. When we recommend a film to them, we're getting anywhere from 7% to 17% of our subscribers going to that film that weekend. Our natural partners are the independent theaters and the independent film makers. If our dream comes true, we'll be having MoviePass exclusives. Robehmed: What was your revenue for 2017? Lowe: I can't give you an exact number because now we're part of a small public company, but it's tens of millions. Robehmed: It’s way more than 2016? Lowe: We did just under $9 million last year. Robehmed: How about revenue sharing with the studios or theater owners? Lowe: As we get bigger and bigger that starts to become material for the studios. So we're demonstrating to four studios and then a bunch of little ones how we can help them be another tool to drive awareness and ticket sales. We actually have one deal already signed. Soon you'll also see an advertising deal. And then there are discounts from the theaters. For example, there's a chain that we have a deal with, where our average cost of a ticket is $7.50. You'll see a growing number of exhibitors signing deals with us. Of course, not the big three. Not for a while anyway. Robehmed: AMC's been very vocal in its opposition to MoviePass. Lowe: Not so much anymore. They definitely threatened us. But now they're like, "We're happy to take their money." Robehmed: Why were they so hostile? Lowe: This is my third time going through this where the incumbent player freaks out. My whole passion is figuring out business models that get people to consume a lot. In every scenario, the incumbent player should have done that themselves. Then when you do it, their first reaction is, "We've got to protect our current business.” The AMCs of the world have lost touch with their customers. Shares of MoviePass majority owner Helios & Matheson Analytics Inc. HMNY, +5.20% gained more than 9% in premarket trade on Tuesday after the subscription movie ticket platform said on Twitter it had reached 1.5 million paid subscribers. MoviePass has been growing rapidly, and demand for the service seems to still be high. In late December, the $10-a-month service allowing members to see a movie a day in cinemas said it had hit the 1 million subscriber mark. It took Netflix, which began by mailing out DVDs, three years to reach 1 million subscribers. MoviePass Chief Executive Mitch Lowe has said the demand was more than the company expected. MoviePass had just 20,000 subscribers before dropping the price of its subscription to $10 from as much as $50 back in August. People who have signed up for the service have criticized the company for not sending them the cards necessary to use the service. Shares of Helios & Matheson have gained nearly 116% in the last 12 months, while the S&P 500 index SPX, +0.16%is up more than 21% and the Dow Jones Industrial Average DJIA, +0.17% is up more than 27%. (Reuters) - Helios and Matheson Analytics Inc (HMNY.O) said on Tuesday it would sell shares to raise funds to increase its stake in online ticketing service MoviePass, sending Helios’ shares plunging 22 percent aftermarket. The company’s shares soared as much as 31 percent in regular trading after retailer Costco Wholesale Corp (COST.O) agreed to offer a subscription plan that would cover a year of membership for both MoviePass and streaming service Fandor for a flat fee of $89.99. Helios did not disclose the size, date or terms of the offering. The company’s shares have sky-rocketed since Aug. 15, when it agreed to buy a majority stake in MoviePass for $27 million. MoviePass, a Netflix-style movie subscription business, allows unlimited access to more than 90 percent of U.S. theaters for a monthly subscription fee of $9.95. The switch to a single $9.95 model in August helped the company’s subscriber numbers surge to over 400,000 from less than 20,000 within a month. To Tuesday’s close of $10.08, Helios had more than tripled in value this year. Helios is a highly shorted stock, with about 42 percent of its total float held by short sellers as of Nov. 30, according to Thomson Reuters data. Helios and Matheson Analytics (NASDAQ:HMNY) announces a new public offering of shares and warrants that will be issued separately. Details on the size of the offering weren't disclosed. The company says that it intends to use the proceeds from the offering to increase its ownership stake in MoviePass and support business operations of the movie ticket subscription platform. Helios and Matheson Analytics Inc (NASDAQ:HMNY) stock was on the rise today following news of a deal with Costco Wholesale Corporation (NASDAQ:COST). The deal between Costco and Helios and Matheson Analytics Inc has to do with MoviePass. MoviePass is a majority-owned subsidiary of HMNY. The deal allows Costco members to purchase a one-year subscription to the service for $89.99. The deal also includes a one-year subscription to movie-streaming service Fandor as well. The offering will only be available to Costco customers for a limited time. Those interested will be able to purchase the subscriptions via the retailer’s website from Dec. 12, 2017 to Dec. 18, 2017. Costco customers that order the MoviePass and Fandor subscriptions will receive digital codes they can redeem for the services. These codes will need to be entered on MoviePass’ and Fandor’s websites to start the subscription service. For those doing the math, the offer from Helios and Matheson Analytics Inc, Costco and Fandor saves quite a bit of cash. A subscription to MoviePass costs $9.95 per month. This comes to roughly $120 per year. The deal is worth it just for that, but the addition of the Fandor subscription makes it even better for COST customers. HMNY stock was up 15% as of noon Tuesday and is up 178% year-to-date. National movie ticket prices are at an all-time high, but one company wants to tempt Americans with a $6.95 monthly subscription service, which allows moviegoers to hit the cinema once a day, for as many days as they'd like. 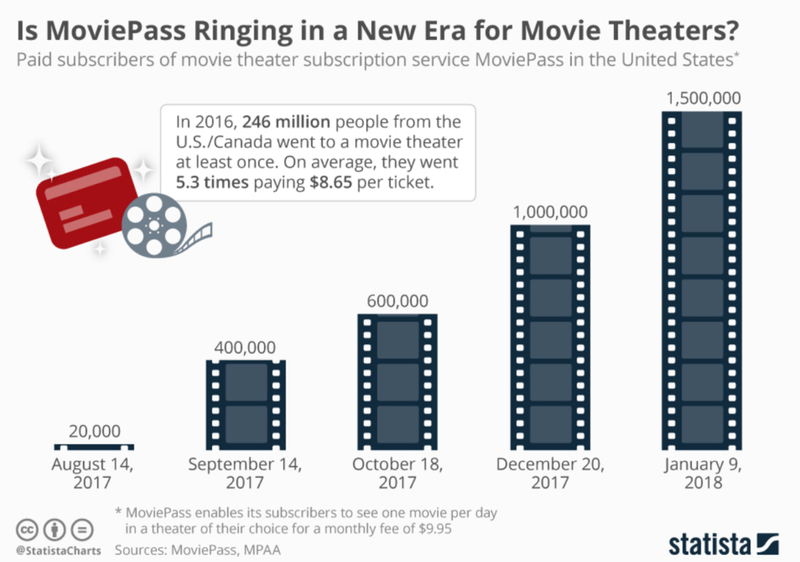 That service, Movie Pass, charges about $1.70 less for a full monthly subscription than the national average cost of a single movie ticket in the U.S.
Ted Farnsworth is the CEO at Helios and Matheson, the majority owner of MoviePass. He says the company is leaning towards a data-driven business model. “That’s really where you make your money --on the data side,” Farnsworth said. Helios and Matheson recently doubled down on its investment in MoviePass, where Netflix co-founder Mitch Lowe is at the helm, by funneling $100 million into the company. Lowe said that MoviePass will use this funding to expand its data science program. But is this a risky investment? Data suggests that people prefer to watch movies at home. According to a Statista report, a cool 52 percent of Americans who watch movies prefer to stay home, while only 12 percent would actually go to a theater. Still, the same firm projects that the movie industry will hit $50 billion by 2020. As of 2016, it was worth $38 billion. MoviePass is riling up some industry leaders, however. Movie giant AMC Theaters released a statement this summer calling the company a “small fringe player,” and stated that AMC is working with its lawyers to see if it can prevent MoviePass tickets from being used at its theaters. “MoviePass announced a change to its ‘subscription model’ that would allow consumers to see up to 365 movies a year for a monthly fee of $9.95. MoviePass envisions paying AMC its full ticket price without discount. The AMC average ticket price for watching a movie at AMC Theatres in the most recent financial quarter was $9.33,” the statement said. This week, MoviePass launched a limited-time holiday sale that allows subscribers to sign up for under $7, although it usually costs 9.95 per month. Farnsworth says that lowering the cost has brought in an influx of new customers. He also says that the company is partnering with tech companies like Uber and Lyft to offer “movie night” promotions, and similarly with movie studios. MoviePass, and its presumptive majority-shareholder Helios & Matheson (HMNY), have been making their case to be remembered as the tech story of 2017. MoviePass, the subscription service that lets consumers pay a monthly fee to see unlimited movies in theaters across the U.S., is slashing its prices yet again. The company announced today it’s now offering its service for $6.95 per month, down from the current price of $9.95 per month, when customers commit to a one-year subscription plan. That works out to a flat fee of $89.95 annually. The deal is a limited-time promotion, as opposed to a permanent pricing change, but MoviePass didn’t say how long the offer is valid. However, it is open to both new and existing subscribers – the latter who would receive a 25 percent savings on their current subscription if switching over to the annual plan. This is not the first time that MoviePass has dropped its pricing. When the company introduced its $9.95 per month, one-movie-per-day plan this August, down from $15 for 2 movies per month (or more in select markets like L.A. and NYC, and going as high as $50), it saw so many new sign-ups it had trouble meeting demand. Within a couple of days, 150,000 new users joined, and by September, the company said that its number of subscriptions had grown to 400,000. As of October, MoviePass had grown to over 600,000 subscribers. It also said its subscriber churn had dropped from 4.2 percent in the first month, to 2.4 percent in month two. The service is today majority owned by data firm Helios and Matheson Analytics Inc. (HMNY), after selling a $27 million stake in August. The firm then increased the purchase price in October to $28.5 million, raising its stake to 53.71 percent from 53 percent. In November, HMNY announced plans to raise $100 million to increase its investment even further. This influx of capital has allowed MoviePass to continue to subsidize the cost of this subscription to the benefit of pass holders, though obviously not profitability at this point. It’s operating in the red while it focuses on growing subscribers. MoviePass hopes to eventually convince theater owners it’s growing their customer base, so it can be cut in on profits, according to CEO Mitch Lowe, in a report from Variety in August. It also believes it may be able to sell the data collected on its subscribers in the future. In the meantime, MoviePass is a ridiculously cheap deal for movie-goers. It now works at 91 percent of theaters across the U.S., though not all are happy with the service. AMC specifically threatened the startup with legal action in August, and announced that MoviePass was “not welcome here.” It said it would try to find a way to opt out, as it believes lowering the cost of ticket prices would devalue the theater-going experience overall. Others, like Regal and Cinemark, are taking a wait-and-see approach, Lowe earlier said. “HMNY continues to be the biggest supporter of MoviePass, as it outpaces any other movie theater subscription service and continues to disrupt the movie theater industry,” said Ted Farnsworth, Chairman and CEO of HMNY, in a statement about today’s new, lower pricing. “We look forward to helping MoviePass continue to broaden its reach and modernize the movie theater industry,” he added. Shares of MoviePass-owner Helios & Matheson Analytics Inc. HMNY, -2.49% were up nearly 9% in premarket trade after the data and technology company said it would raise $100 million in convertible notes in order to increase its stake in MoviePass. The conversion price of the notes is $12.06 per share. The deal will allow Helios and Matheson to pay the remaining $5 million balance the company owes MoviePass after closing its previous securities purchase agreement back in August. The financing will also be used to pay MoviePass an additional $20 million to exercise its option to increase its investment in the movie theater subscription service. Canaccord Genuity served as the sole placement agent for the financing, and Palladium Capital Advisors acted as a financial advisor to Helios and Matheson in the financing. "This investment should allow us to further augment our data science capabilities and platform to respond to the needs of studios and exhibitors and their challenges in better understanding their customers," MoviePass Chief Executive Mitch Lowe said in a statement. MoviePass recently said its subscriber base has reached 600,000; up from 20,000 before its subscription price cut back in August. Shares of Helios and Matheson are up more than 192% in the year to date, while the S&P 500 index SPX, -0.38% is up close to 16% and the Dow Jones Industrial Average DJIA, -0.43% is up more than 19%. (Reuters) - Helios and Matheson Analytics is in talks with several investors and investment banks over the future of its growing MoviePass business and does not rule out delaying a public floatation past March, Chief Executive Ted Farnsworth said. y taking on a platform that was already “disrupting the movie theater market with a subscription-based model” and subsequently reducing the monthly subscription, the analyst already sees a bump up in demand. Anticipating the asset will help HMNY establish a foothold in the industry, grabbing “outsized revenue growth” and accelerating shareholder value, Kinstlinger initiates with an upbeat throw of the dice on this big data firm’s opportunity ahead. As an expert in strategic development, marketing and consumer relations; Mr. Farnsworth has utilized these assets and skills building companies throughout his 30-year career. He has owned and operated numerous companies with proprietary products with recognized brand names that he actively helped to develop like Purple. Many of these companies ultimately became publicly held. Helios & Matheson is a Big Data company that helps global enterprises make informed decisions by providing insights into social phenomena. Their extensive domain expertise empowers their clients to unlock the value of data to make better decisions. They deliver integrated services in Big Data technology and Advanced Analytics that include engaging in Data Visualization. Helios and Matheson recently announced that is entered into a definitive agreement to acquire a majority stake of movie subscription technology company MoviePass Inc. HMNY’s innovative growth strategy through the expansion into industries with opportunities for big data and artificial intelligence innovations seeks to increase shareholder value.